Samsung's trade-in program is messed up right now! Samsung is considered a giant in the electronics industry and has the biggest market share in the smartphone industry. In the first quarter of 2018, Samsung phones had a market share of a whopping 20.5% followed not so closely by apple at 14.1%. Infact in the fourth quarter of 2018, Samsung shipped 70.4 million units. These statistics clearly show market dominance and monopoly of Samsung smartphones in the market. Samsung is not new to controversy with their “phone-bomb” model Samsung Galaxy Note 7 which was notorious for exploding and catching fire. Samsung confirmed themselves that this may be due to faulty batteries. With the Note 7 woes seemingly behind, this time its Samsung’s “Trade-In” offers that are being ridiculed by a lot of frustrated customers, mostly those eying the latest Galaxy S10 handsets. The trade-in offer was not complicated at all. Select a new device you plan to buy, mention the device you want to trade in, and depending on the eligibility criteria, you would be given a trade-in amount as credit for selling your old phone. 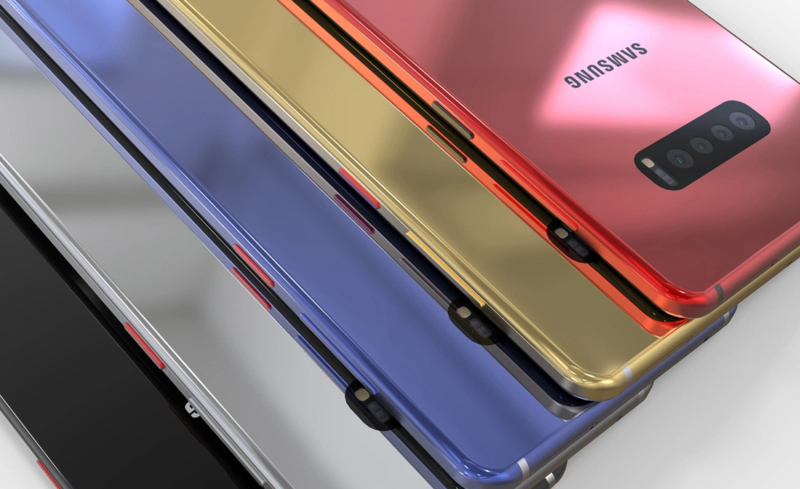 They had promised a maximum trade-in amount of up to $550 for those in the market for a new Galaxy S10, but the handset being brought in has to be in working condition and should be able to power-on. Also, any cracks would make the handset out of eligibility criteria. The consumer is supposed to factory reset the handset and ship it to Samsung. Unfortunately, things did not go the way it was intended and soon buyers started going legal and approaching Better Business Bureau for complaints. Some of the complains include Samsung not identifying the correct handset provided to them but instead giving credit for a low-end model. Identifying issues with handsets which made them ineligible for trade-in offer but such issues were non-existent as per the buyer before shipping, and other similar issues resulting in denying the trade-in offer. Buyers have clearly stated that it is much better to use your carrier trade-in program which is much likely to get you a better offer. In this case, a buyer had apparently shipped in his phone in “good condition” but he never got credited for his exchange and in fact, the buyer has still not received acknowledgment that his phone has been received. Consumers also complained that despite their handsets being in perfectly good condition not only internally but also cosmetically, still their trade-in request was rejected. In such cases, customers were expecting that if the company did get a phone meeting eligibility criteria but there were some minor issues they should have been given some credit instead of refusing the same completely and taking more than a month to respond on the issue which is completely frustrating for the buyer. Furthermore, this user writes his issue very elaborately. The buyer had apparently traded an S9 for a new Note 9. It all started when the buyer bought a Note 9 in October 2018 and was promised a $600 trade-in value. The buyer thoroughly photographed the S9 which was in great condition and shipped off the same to Samsung. To his shock, he received a credit of $50. There was a long battle fought by the buyer which included going to Better Business Bureau and taking legal steps. 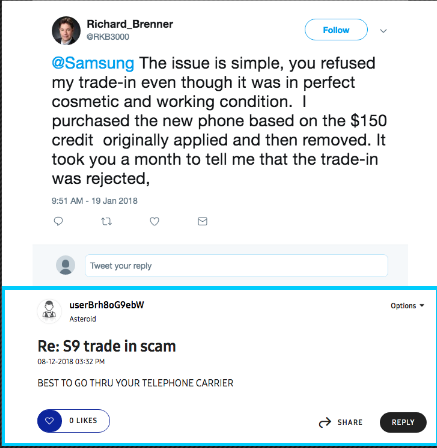 In the end, the buyer received a $550 credit from Samsung on March 2019, to sum the promised $600 credit. We can clearly imagine how terrible the customer experience would have been for this buyer and despite having ample proof, they still received a lesser amount after struggling for 5 months. There could have been disagreements between the buyer and Samsung about the exact condition of the phone but still, such cases need to be resolved at the earliest to provide greater customer satisfaction. Finally, let’s look at some third party survey conducted by a website to see how satisfied the customers are with Samsung. It’s not surprising that Samsung customer service is ranked #613 out of the 953 companies rated by buyers on this website and it’s customer service is rated Terrible. Samsung on the other hand has hardly responded publicly to any buyer. While doing our research we found innumerable complaints on the internet but hardly a few of them had a response from Samsung and even the responses were very vague and did not have a proper solution. Buyers are just being directed to Samsung customer service which is resulting in an endless loop causing major buyer dissatisfaction. We would recommend the buyers to opt for their “Carrier trade-in” offers which have been shown to have better results and higher customer satisfaction. Privately operating services like eBay can be used to sell your phones, the price offered may not be as high as Samsung itself but it will mostly result in lesser frustration and faster turn around time to complete the transaction. On the contrary, if you feel Samsung is giving a sky high trade-in amount, we would seriously recommend thoroughly inspecting your phone and take ample proof in terms of pictures or video in case of any disagreement with the handset company while doing such trade-ins.